The JCW Sound Traffic Barrier has also been designed in accordance with the specification for Highway Works Clause 2504. Treatment to Sector Scheme 4. JCW Sound Traffic Barrier can be fitted to timber posts (for illustration purposes only). 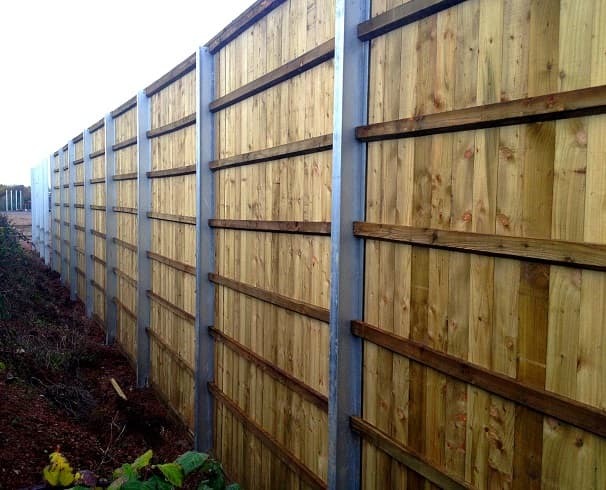 Steel posts can be an alternative. Height of JCW Sound Traffic Barrier variable to suit specific locations. Post centres at 3.0m unless otherwise specified. Complies with Highways Sector Scheme 2C for the pre-fabrication of environmental barriers.